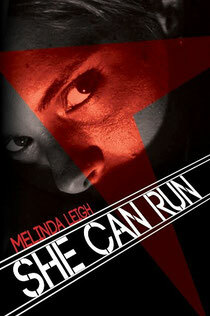 When I first saw the cover of She Can Run, I was intrigued. Taking the time to read the synopsis, I knew I would have to read the book. I didn't bother reading reviews others had left on Amazon because people feel differently about what they read; what appeals to one person another may hate so, as with any other title, I chose to read the story before reading the reviews. Backwards? Perhaps, but it's what works for me. I don't like to have a biased opinion going in. I was hooked from the beginning and knew the book would keep me up long into the night. It turned out I read the book over a period of two nights plus a few hours during the day. I was drawn into the main characters' lives completely and wondered what direction the story would take. Having been a victim of emotional abuse, I could understand why Beth found it so hard to leave her less then desirable husband but, when push came to shove and her life was threatened, she took her kids and fled. Thankfully, she had an uncle with connections, enabling her to disappear even if she would be looking over her shoulder at the estate where she would be going. She and her children had been traumatized enough; a break was well deserved. Seeing the way Beth's daughter, Katie, reacted to Jack (retired cop who inherited the estate where Beth was going to be living) was heartbreaking. Jack was a good guy and, even if his thoughts were a little too sexual for my taste and his words a little too foul sometimes, his intentions were pure in his desire to protect Beth and her children. Of course, one needs to know what is going on to be effective in helping but, when dealing with the emotional scars of three people, having someone open up is nothing short of a miracle. I knew I would see this story through because the characters made an impression on my heart. On another note, there was a subplot of a serial killer and, by the time I had finished reading the book, I knew my prediction had been right. As for the big secret Beth's husband was trying to keep under wraps - was even willing to kill Beth for since she found out - I had figured that out almost as soon as it was mentioned. I guess, in some ways, She Can Run was predictable. If I had been looking for a book which kept me guessing until the very end, it would have been, somewhat, disappointing. That being said, I admire the way Melinda Leigh reminded us that sometimes the person we trust most is the person who will hurt us more than any other. Furthermore, everyone has their secrets, no matter who they are or what position they hold. Some secrets may hold greater consequences than others when found out but everyone has something they don't want someone to know and She Can Run brought that point home loud and clear. All things considered, I enjoyed reading She Can Run. I wasn't looking for a true story, nor was I looking for a story which would be completely plausible. Not many fiction books are in every element of their story. Now that I've read the worst reviews She Can Run has received, I can say some reviewers are far too cold, in my opinion. If they don't like a book, fine. Leave a star or two and move on but there was no need for some of the comments which were made. Thankfully, of all the ratings for She Can Run on Amazon, 4 and 5 star ratings took the majority, as it should have.